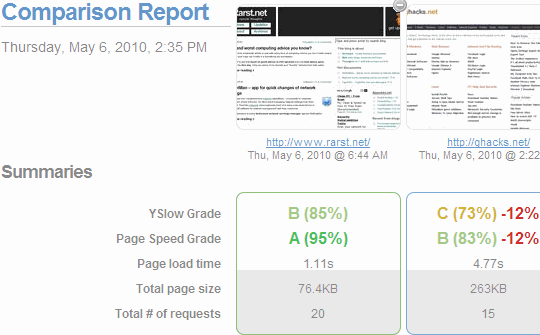 YSlow and Page Speed are essential tools for optimizing site performance. However there is considerable installation curve to them – you need Firefox (not a light requirement), Firebug and versions of everything that play well with each other (which Firefox often makes difficult). Vladimir Prelovac had tweeted today about GTmetrix which turned out to be online version of these tools. As all services of this kind (see site load timers roundup) it takes URL as input and runs tests. What is interesting that instead of some homebrew algorithm GTmetrix plainly uses YSlow and Page Speed. Results are presented in report with total scores and specifics breakdown – separately for both algorithms. Obviously there is no installation hassle, you can easily get results in any browser and there is bookmarklet provided. There are also some additional features that site itself adds. First it gathers statistical data from all test and you can see how your percentages compare to averages. It makes easier to distinguish between most usual tweaks and advanced rarely used stuff. Another cool feature is being able to compare reports of up to four sites. Old versions of YSlow confused people with constant CDN and other advanced requirements. Newer version have several profiles so people with smaller sites can switch and only get relevant advice. GTmetrix sticks with default profile (V2) only, so CDN and such comes up all the time again. It is covered in their FAQ but is still annoying and drags score down. 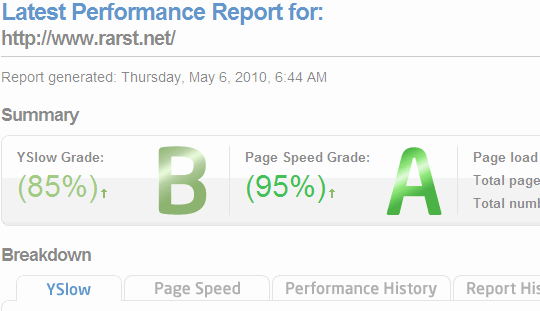 Obviously service doesn’t replicate full functionality of either YSlow or Page Speed, but it does provide fast and convenient access to total scores and bulk of results.